The Dalai Lama wrote a book entitled Ethics for the New Millennium, one of the best books of the 20th century; an editor friend of mine told that this book was a miracle, it was on the best-sellers list of The New York Times for five to six weeks, although with 'ethics' in the title, it is normally impossible in America. Editors don't want to hear about 'ethics', they just want to make money. This book is so good. The next time, I met the Dalai Lama, I told him: "You should accept the role of prophet, the 21st century prophet". He said: "Absolutely not". But he was thinking in term of someone predicting the future or challenging the king or power-in-place. I explained (the meaning of prophet), he, however, never acknowledged that he would play this role. His movement is to provide freedom for Tibet, whether it is (in the form of) autonomy or anything else; in fact it can only possibly be autonomy (unless China explodes). Why are the Chinese not listening to him? Because the leadership is afraid of its own people. Lee Kuan Yew of Singapore pretends that the Chinese have a slave mentality, that they have no individuality. It is false. The Chinese are very happy to have fun, to gamble, to drink, to run after girls, like any other human beings. They have also the tradition of being suppressed by other people. They are just human beings. (Mainland Chinese), like in Taiwan would do well in a democracy. They want democracy; they don't believe in the Communist party anymore, they laugh at it. Because of the nationalism hat that they have to wear, you may not think that they do, but underneath, they want. The Chinese government knows this. Today China is basically a capitalist oligarchy; there is an elite with hundred times more money than their workers. They are not Communist at all, but they use a Communist ideology; particularly the dictatorship of the proletariat while at the same time suppressing the proletariat. The leadership is afraid of the masses. Because they are afraid, they think that if they show reasonableness, intelligence or gentleness to foreign people like the Tibetans (because intuitively they know that the Tibetans are foreigners), they will lose control over China; if they show this type of sentiment, the Uygyurs and others will demand the same and finally the Chinese people will also demand freedom. That is why in their minds, it would split China? It is like a domino, like when the stupid Americans were fighting the Vietnamese. The Americans believed in the domino effect. But in a long run, you can't suppress a freedom movement, even with the best weapons. That is the real reason why they are afraid to talk to the Dalai Lama. In an interview, the Dalai Lama told me about his dream to perform the Kalachakra puja at Tiananmen Square. What do you think about this? I believe that it will happen. You have to realise that a rabid nationalism is today used by China to replace Maoism. At one point, when the Chinese leadership will reach the point of pulling the trigger, they will have to face a reality: 1.3 billion people with all their technologies will be outnumbered by the Russians, Japanese, Indians, Americans or Europeans together (the rest of the world is against them. A former defence minister of China said if the Chinese leadership is able to take lessons from Hitler, China could dominate the world. Exactly. They are pumping that up. But when they reach the point of an actual war, they will realise that it would suicide (and it would be). They would then realise that the Dalai Lama can be a benefactor. If they were smart, they could see it now, but they are not. The major event of the 21st century will be to develop a dynamic world community, a democratic civil society with a proper representation for all people of the world in the United Nations and with China as a major factor, but as an equal, not as a conqueror. In order to bring the (Chinese leadership) into this cooperative fold, one needs someone to help solve this exaggeration (their imperialism in Tibet). They need the Dalai Lama's help to rekindle their spirituality and help them go over their own brutality. The Dalai Lama could enable China to move smoothly to a more democratic system, perhaps even more smoothly than the former Soviet Union did. An event that the world cannot afford during this century is a World War III. We can't also continue with this insane form of global capitalism, consumer capitalism, burning coal, oil, destroying the environment, etc. I know, I know. I always speak sustainabilism, it is an awkward word, but it should become like a 'religious' movement, we need a quantum leap in understanding this concept. Well, we have it and it is fortunate, because it shows the falsity of the system. Take Tibet, it has been predicted that by 2030, a lot of glaciers will be gone. There might be a controversy (with the date), you will always find a scientist funded by oil companies to say that it is wrong. But I have seen glaciers shrinking with my own eyes in Tibet. You can see that they have receded. Like in the case of Greenland, I personally believe that it will be faster than the scientists say. It is an exponential curve. The Chinese admit today, I have read it, that what is happening to the Tibetan plateau is due to the mismanagement by the Chinese People Liberation Army's businesses; the desertification of the steppes, the cutting of the forests, the creation of big cities by colonising Tibet, increasing the temperature. It is even not good for the Chinese who are brought up there; their bodies are not used (to the high altitude); (Han migration) raises the temperature faster than global warming. Then with all major rivers of India have their source in Tibet; the desertification of the plateau is a mega ecological disaster (for India). It will be a major problem for every city in India. It is a slower, but more dangerous than a tsunami. A true sustainable globalisation involves a re-localisation of economic practices, rebuilding village community. You probably know the story of the Scottish engineer who was sacked during the British Raj because he recommended rebuilding village tanks and objected to mega-projects. Big projects to be successful, have to be footed in the local economy, otherwise you will end up with problems like the disappearance of the Aral Sea or the forests of Siberia. And then, there is another danger. In its imperial mood, China is surrounding India. It is very much a danger. With Tibet following the India tradition of ahimsa and the global visibility of the Dalai Lama who embodies these values, he should be supported by India as a diplomat. It would be in India's self-interest and instead of being embarrassed about his presence, India should recognise this (role). By appeasing China, India does not get anything in return; they (the Chinese have not stopped) claiming Arunachal, part of Kashmir, etc. As for America, we can't afford to continue its (role) of world policeman. America needs to help local people to work their problem locally. Non-violence should become something important for the US. America should support sensible dialogue and negotiations amongst people (like in the Israel-Palestine case). America should rely on good practices and ethical behaviour; it is essential for US interests. 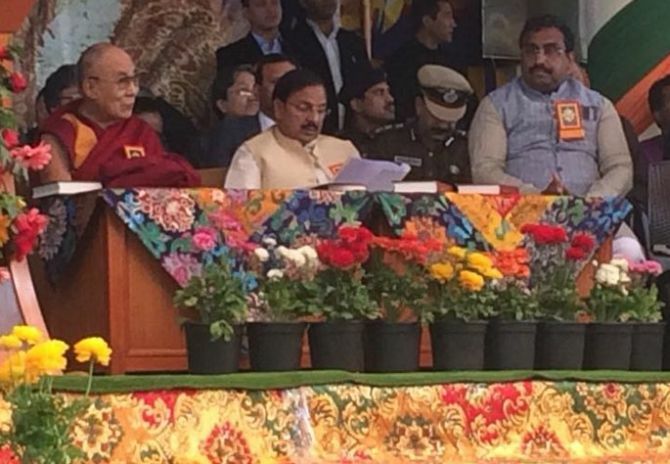 When President Barack Obama met the Dalai Lama, they did talk about human rights and the preservation of Tibetan culture, he did not pretend that it was only a social meeting. Is it true that the Dalai Lama had to come through the kitchen door? It was not really the kitchen door. Obama acted like Gandhi, you have to be sensitive to your 'enemy's' feelings. The Dalai Lama would have agreed with him. The fact that there was some garbage was due to the terrible snowstorm, there was two feet of snow and garbage had not been collected. It was not to please the Chinese. Not the garbage bags. The (exit) was maybe to appease the Chinese; it was probably decided with the Chinese. The Dalai Lama does not want (to antagonise the Chinese). He looks happy (in the photograph) playing with snowballs. People noticed the door, but what was not mentioned was the fact that Obama gave the Dalai Lama a bound copy of the letters written by Presidents Roosevelt and Truman to the Tibetan government before the Chinese arrived. It was bound in leather. This was a strong signal. The point was to show that the US has been (directly) dealing with Tibet in the past. The Chinese probably had a fit over this, though they were smart enough to not make a fuss about it. It was a strong signal despite the appeasement stuff. This interview was first published on Rediff.com in April 2010.